Bite-Sized: Grand Market | Wake up, Meeples! Grand Market’s effect is very powerful, and it would be a good addition to almost every deck, provided you can afford it. It’s strong because you get to add payload to your deck without having to spend extra resources drawing that payload or decreasing your deck’s reliability. However, the restriction on Copper makes the cost very high. Without Copper trashing, Grand Market is sometimes not worth going for, in the sense that you may not want to build your deck enough to hit $6 consistently without Coppers in play even if you would still want the card if that situation came up. 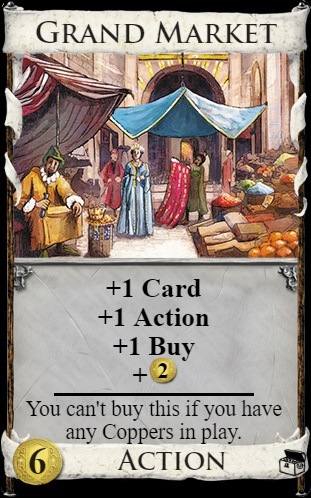 If you can sidestep this part of the cost, usually by gaining the card in some way other than buying it, Grand Market gets much stronger. Once you have a couple of Grand Markets in your deck, future Grand Markets become much easier to buy, meaning the pile will frequently empty. In this cases, it’s usually wise to be thinking about Estate pileouts for the rest of the game.